The Adam Equipment Eclipse EBL 254I analytical balance has a capacity of 250 grams and a readability of 0.1 mg with a pan size diameter of 3.5 inches (90mm) and includes internal calibration. While it is designed to be aesthetically pleasing, the real benefits are highly efficient operation and an increased lifespan of the balance. When a key is pressed, the pad responds and reacts immediately, whether the technician is barehanded or wearing protective gloves. The keypad's smooth surface allows fingerprints, grime and spills to be wiped off easily. A large display shows two full lines of white text on a black background, with seven digits of 18mm character height to produce exceptional visibility. The Eclipse's innovative design results in a compact footprint, so the balance occupies minimal space on the laboratory work bench while retaining a high level of performance. Its base is formed using a single piece of extruded aluminum, a material that provides superior temperature regulation. The single-piece construction offers greater stability, enabling highly repeatable results. 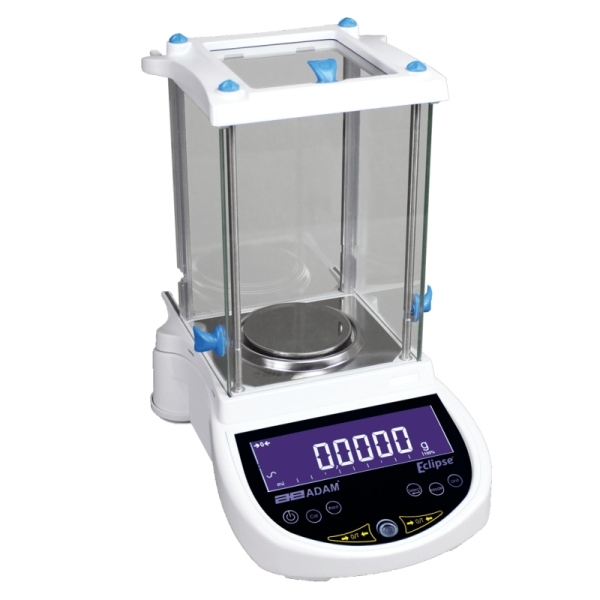 Containing fewer parts than a traditional force motor balance, the weighing sensor features an optimized internal mechanism fabricated of hardened materials, helping the Eclipse tolerate rigorous laboratory use. Highly efficient mechanics, plus improved processing power of the electronics, leads to superior performance.